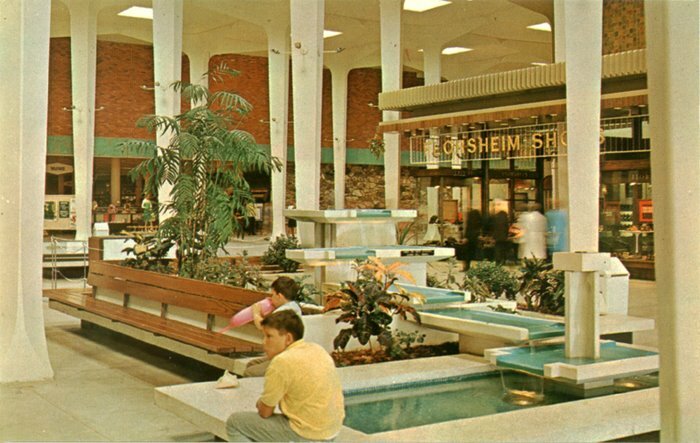 Like many dead malls, this one's history was a colorful, and ultimately, sad one. For a number of years a thriving, happy place to be, only to wind up dying an ugly, steady death, beginning in the early '90s. 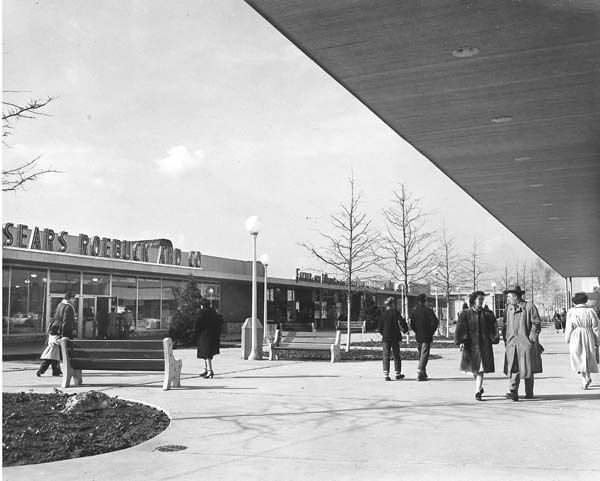 It was razed to make way for a standard strip mall site called, Granville Station. Not too shabby, eh? 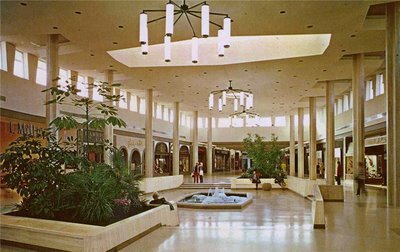 Winter Park Mall (now Winter Park Village) really had a nice center court. This scene is just an amazing sight to my eyes. The views at the aerial link below are quite spectacular, too! 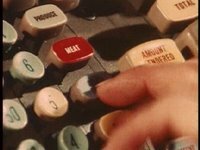 I'm sorry, but I just love the heck out of these goofy old public domain industrial films! Can't resist posting them here (and I think they're related enough, in the general scheme and mood of things). You'll have to bear with me if you don't share my enthusiasm, cuz I think they rock. :) And this one is almost a pop art masterpiece of exploding colors, music, hair-do's, and groceries, in my opinion! This film is a 1965 instructional short from the Super Market Institute, that delves into the fine art of cashiering, and all that it entails (which is a lot, it turns out). 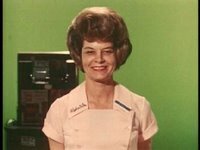 There's some really nice vintage grocery store footage in it, including all those gaudy, old-timey cash registers and food labels and what not. 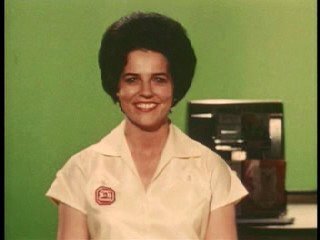 I know this whole super market deal pretty well myself, as a matter of fact, having worked in a huge Farmer Jack grocery store here in Michigan for quite a while many years ago. Those people earn their money, let me tell you! (The good ones anyway, who actually care and work hard at it, which not everyone does.) It aint no jazz garden, that's for sure. Beautiful fountain and interior of Exton Square Mall. Looks like a pretty tall plume of water there! Impressive scale for an indoor fountain. 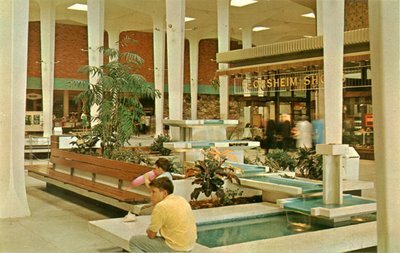 Actually, this fountain court, looks very similar to the one that was in Cinderella City Mall. Almost an identical setup, even down to the apparent water spray height (40-foot plume Cinderella City had--not sure this one is quite that tall). 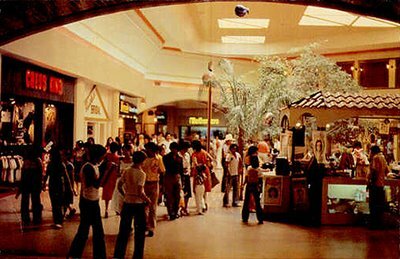 "The Mall was shut down in 1984 after owners felt it could not compete with newer or expanding malls like Vallco and San Antonio Center. The building was converted into an HP office building. HP is vacating the building in the near future, and the future development of the property has yet to be determined." 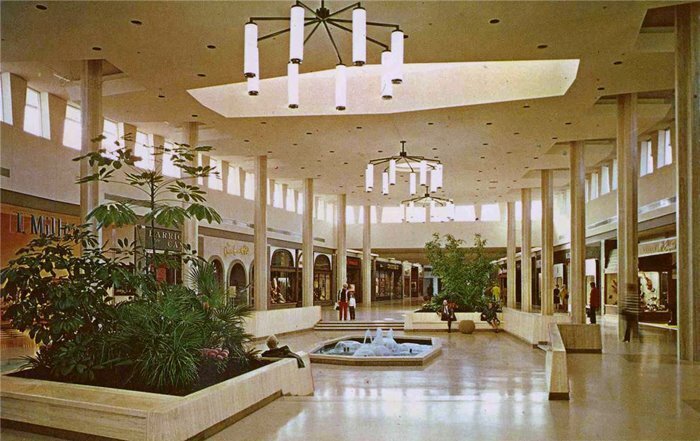 Obviously there's no official website for Mayfield Mall (Northern California's first fully enclosed, climate-controlled mall) since it's long gone, but a quick search found some good background info on this cool page, among a few others, if you're interested. 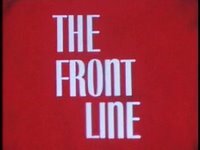 "Promotional video put together by the Paw Filmworks "Dixie Square" documentary crew back in November 2005. 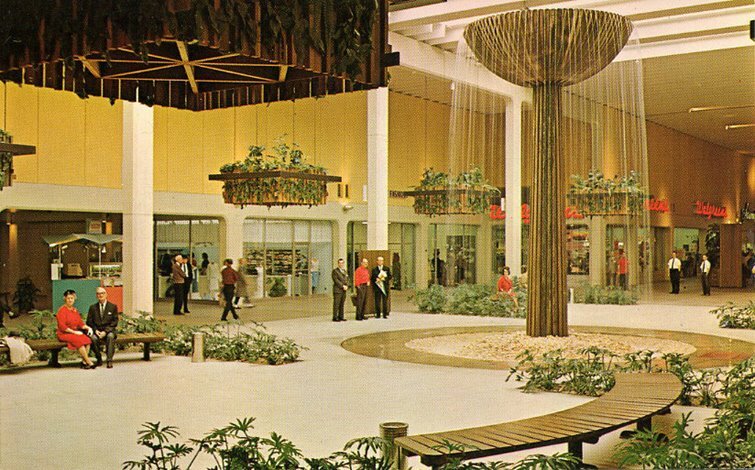 Some never-before-seen footage of 'The Deadest Mall In America' set to the music of Parliament Funkadelic's haunting 'Maggot Brain' instrumental." 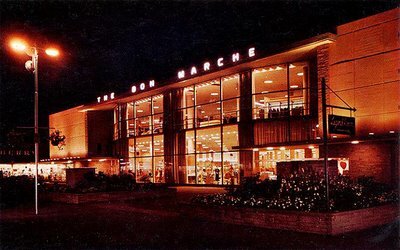 "The Bon Marche opened in August 1964 before the rest of the mall was built. 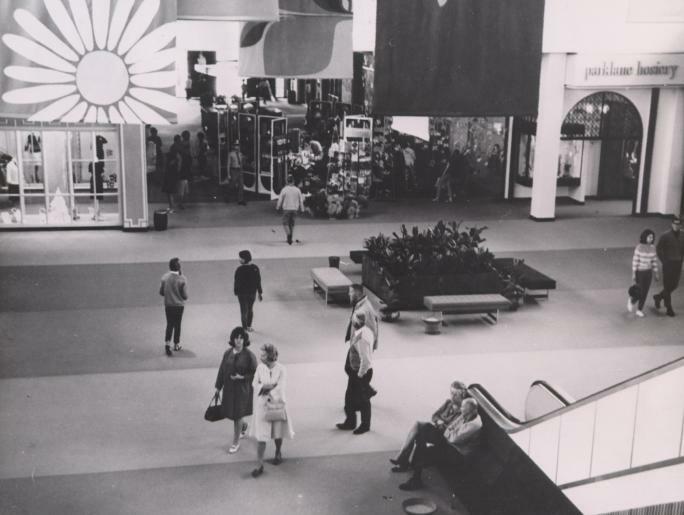 J.C. Penney and the main concourse opened in October 1965, and Nordstrom-Best opened in 1966. That was Phase One. Liberty House (later Frederick & Nelson and now Mervyn's) and a west wing was added in 1973. Sears and the northeast wing came in 1981. 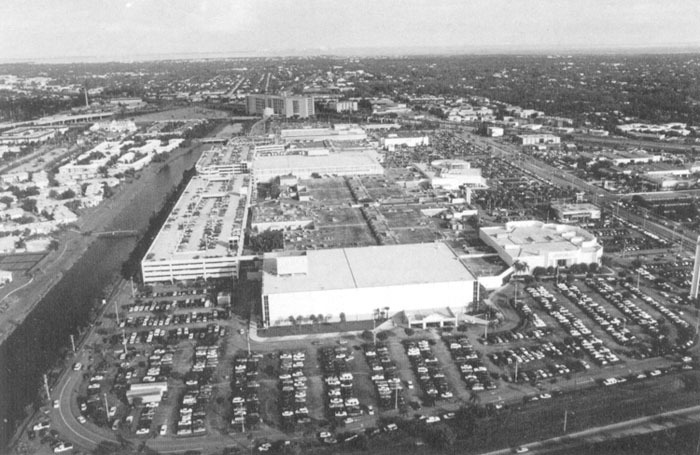 Nordstrom expanded in 1983. A significant remodel came in 2000, which added a food court. More changes will come next February when Mervyn's goes out of business and their store will be demolished to make way for a new Nordstrom. 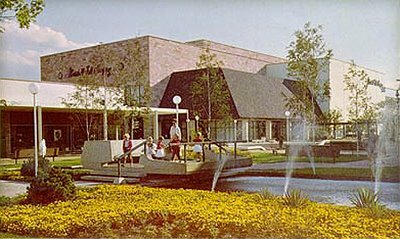 The very dated current Nordstrom will be torn down for an outdoor lifestyle center--BOO!" 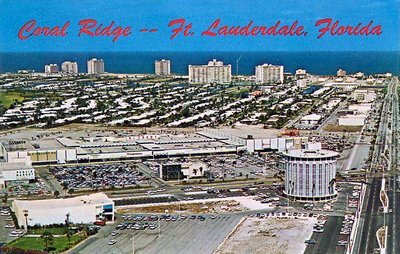 Need some data on the Coral Ridge Mall if anyone out there has any to share. Found very little online about it (at least around my usual haunts). I found no official website for it, nor do I know what year it was first opened--though I know it's still there and operating. Many thanks to Rob, for this great submission! Please Note: Posting is currently a real struggle here this morning (and was yesterday too! ), as Blogger is having some serious problems right now. I'll try to at least get something posted here in the next few minutes while I have time (if it'll let me), but basically, if you don't see much new here today, and if the site is hard to even get to load and you get weird errors, you know why. Hopefully they'll get it all worked out later today. 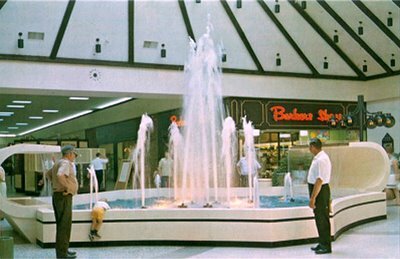 No, these aren't all mall fountains (or even in America), but heck they're fountains, and those always remind me of the shopping mall vibe! And besides, what climate-controlled mall blog worth its salty pretzels wouldn't offer you some sweet fountains to gaze at and cool off in--especially when it's so flippin' hot outside, like lately in many portions of the US?! So here are just a few of the many nice water fountain videos I found on YouTube of late. Let's kick off our shoes, relax for a few moments, and take a little fountain break! :) Btw, to avoid auditory annoyance, watch the volume, as some are louder than others. 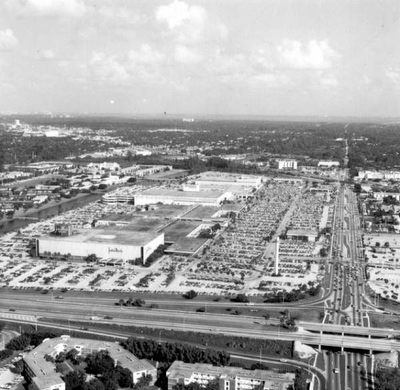 Here's another aerial photograph of Dadeland Mall, but this one from a few years earlier than the one I just posted a couple days ago. This is a shot of the mall around the time it first opened in '62 (notice the growth changes in the 1975 photo). And how 'bout let's time travel back to the future (heh), to 1975, and go inside, shall we? Vintage yet decidedly modern looking interior photo (thanks to Alex, for both great image finds here!). During a promotional event at the shopping center, Children ride through the parking lot on an "elephant train"! This is why malls and shopping centers rocked in the good old days. 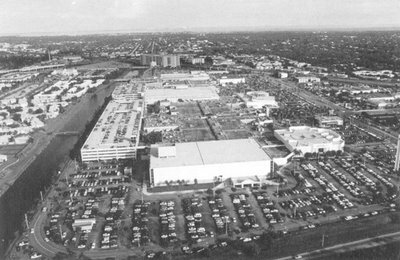 Fantastic sprawling aerial view for another mall I've never featured here. 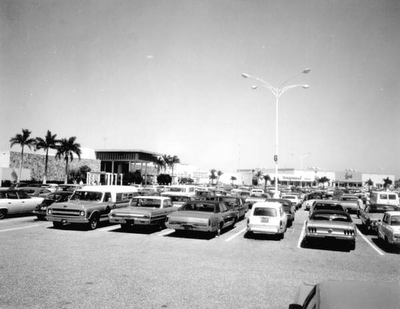 Welcome to Dadeland Mall! Funky interior shots of this one are coming soon. Vintage store toy commerials! The Penneys video shows many great ones in their lineup, and the Woolco & Woolworth one is for a cool Tyco racetrack set! Had several of those babies over the years. An annual Christmas gift staple at my house growing up (needed a new one every year to replace the one we got last Christmas and promptly broke within a couple weeks). 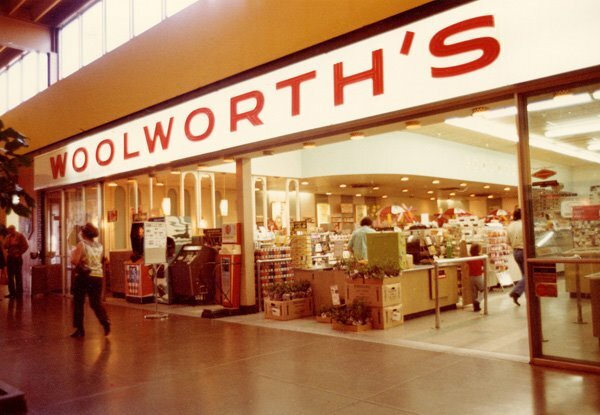 No trip to our local malls was ever complete without a stop in Woolworth and Penneys! Nice little view of an outside promenade court area at The Levittown Shopping Center (as it was originally named). 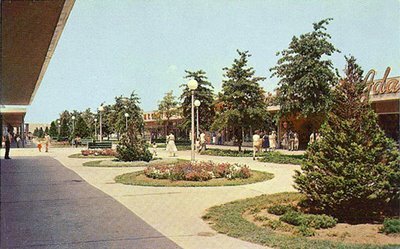 Within a couple years of its 1953 opening, it would be officially renamed the "Levittown Shop-a-Rama", which never stuck with the public, however, who continued to refer to it by its original name. 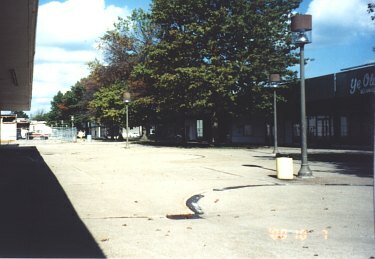 In 2002, the site was redeveloped and renamed yet again, reopening this time as the Levittown Town Center (allow myself to introduce...myself. Heh). Some of the original stores here included Woolworths, Sears, Kresges, Pomeroys and Penneys, to name a few. 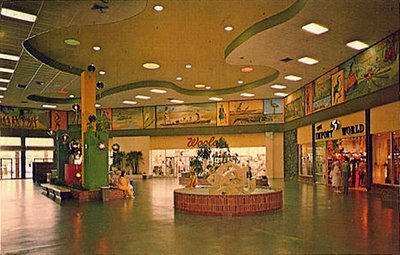 I will definitely be doing more entries on not only the Levittown Shopping Center and Levittown itself, but also its famous visionary developer, William Levitt, which is a whole other story in its own right (lots of great links & photos to share on that stuff eventually!). Talk about funky (and pukey)! 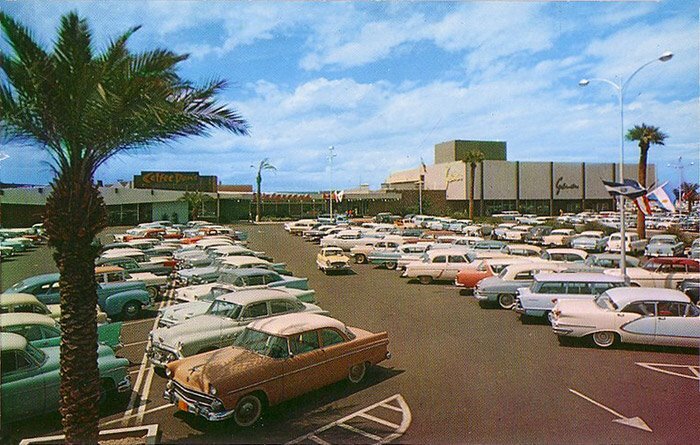 Here's Seminole Mall, in all it's harvest gold/avacado green glory. They sure don't make interiors like this anymore. At least not on purpose. Not the best quality shot, but it's all I have at the moment and I wanted to post it. 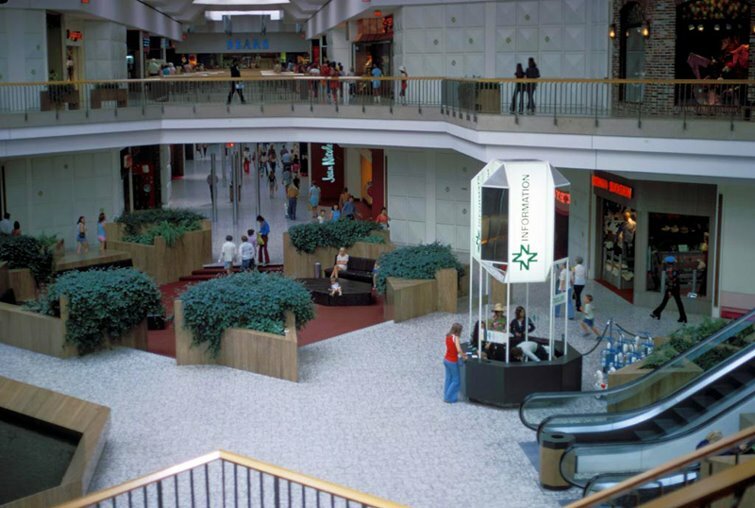 There's an interesting 2002 article on this mall and its struggles to stay afloat, right here, if anyone's interested. Midtown Plaza mall "Clock of the Nations"
You've seen this mall and its famous clock frequently here at this blog, in pictures, so now how would you like to see it in action, and from right around the time the mall first opened? 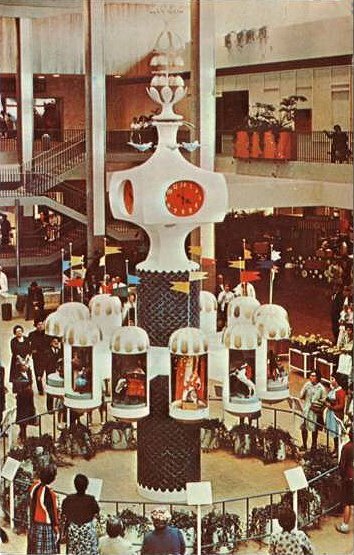 Back of postcard reads: "The unique 'Clock of the Nations' is the focal point of Midtown Plaza mall. Visitors gather each hour and half-hour to watch animated dolls dance to music of twelve nations. Midtown Plaza, in the heart of downtown Rochester, NY, boasts more than 1,000,000 square feet of stores, shops, services." 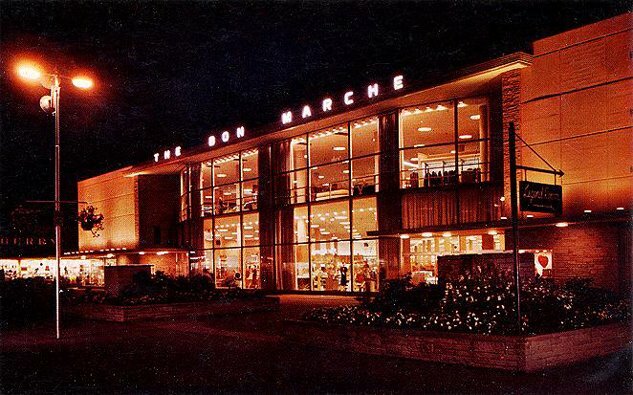 One of the original Northgate Mall anchors, The Bon Marche department store, lit up and glowing brightly, beckoning to shoppers, in this wonderful vintage nighttime photo! 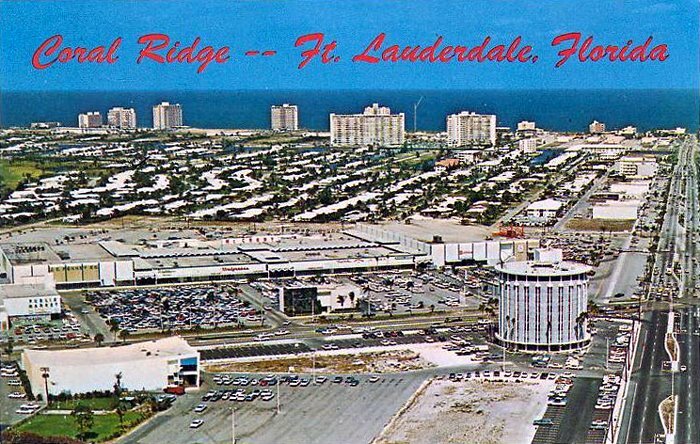 This postcard literally doesn't say which mall this is! 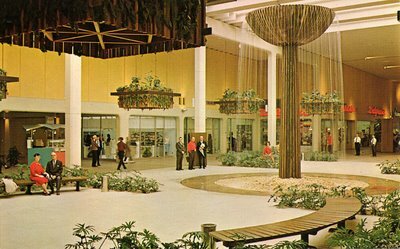 So I've done a little quick digging and I'm gonna deduce that it's most likely Kennedy Mall (the first climate controlled mall in Iowa). Please feel free to correct me if you think I'm wrong, and I'll fix the post later. 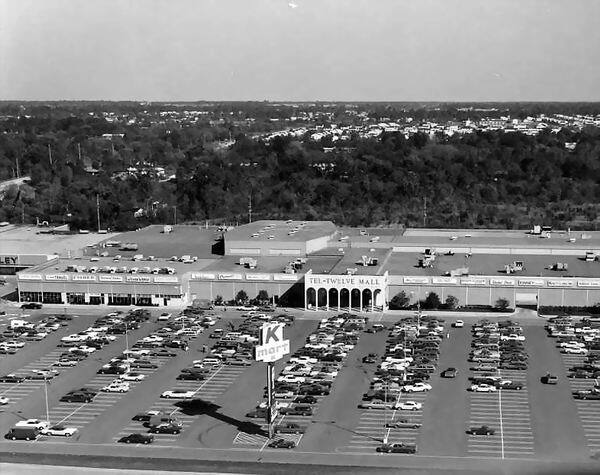 But assuming this is Kennedy Mall like I think it is, I'll point out that stores actually began collecting at the site of this future enclosed shopping mall in 1964, but it wasn't offically opened as a mall until 1970 (decent history can be read at the Wikipedia link below). Personally, I think this is another of the absolute grooviest shots yet here! 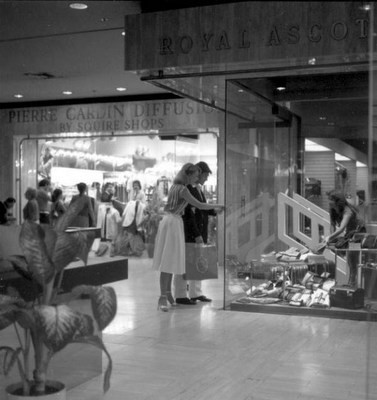 This is the kind of classic, vintage shopping mall photo I really love. The funky space-age design (look at that ceiling! ), the colors, the fountain, the little kid playing in said fountain, the plethora of nerdy old dudes, etc. It's got it all! Retro Video - "In the Suburbs"
Great, cheesy old 1957 public domain promotional short from Redbook Magazine, In the Suburbs. For me, the study of Suburbia is directly related to (and parallels) my interest in vintage malls and shopping centers. 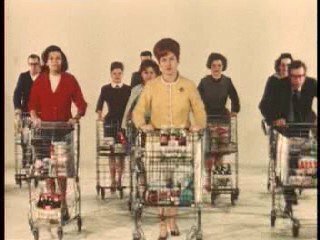 Which is why I'm sharing this kitschy old documentary about the Suburbs, and the young families who live, work and shop there (circa the late '50s). Video quality isn't that great (original is crystal-clear, of course), as this one is pretty long (almost 20 minutes), so Google really compressed it. But you'll get the drift. 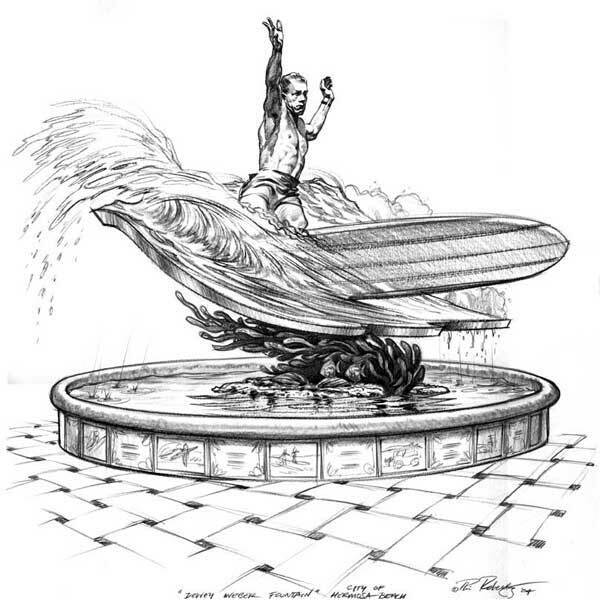 Anyway, if you've never seen this before (like at The Internet Archive, for instance), then grab a nice cup of coffee, sit back, relax and ride with the young adults! 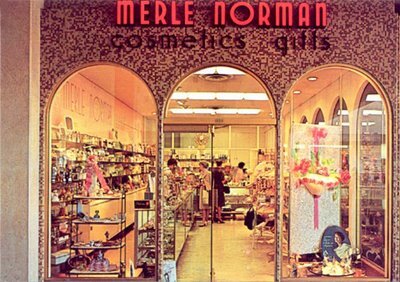 Super stylish looking Merle Norman cosmetics & gifts store, inside Lloyd Center mall. Nice storefront design. And just look at all the wonderful little gifts it's chock full of! Bet there's some mighty cool stuff in there. The Pompano Fashion Square Mall (as it was originally named), was initially an enclosed shopping center, that was redeveloped in recent years, into an open-air mall layout. 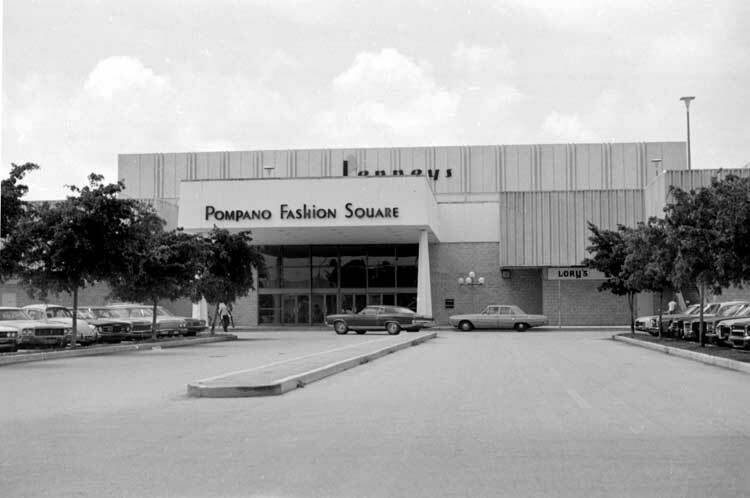 It was also renamed, and is now known as the, wait for it... Pompano Citi Centre. How thrilling. Boy, they're really working hard these days to get the "mall" out of the shopping malls, aren't they? Unbelievable. Anyway, in this nice shot above, we can see the Penneys anchor at this entrance (many thanks to MOA reader, Alex, for finding this fantastic shot for the archive!). 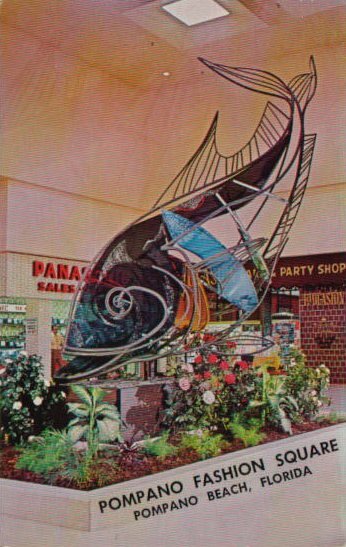 Keep in mind that this is the mall that sported that really cool, huge fish sculpture that I featured in the other Pompano Square entry. Of course, this was back many years ago, when the place still had a soul. For me, this mall would have been worth a trip just to see that weird looking fish in person! 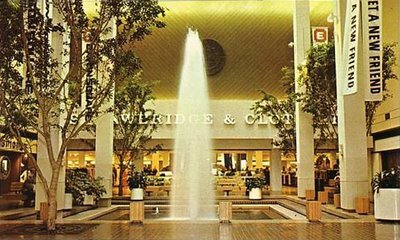 Be sure and read the comments in the other entry, too, for some great memories of this mall--and its huge fish. 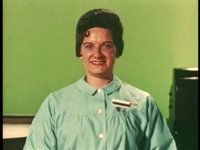 Here's a couple of wonderful vintage photos to start the weekend off right! First one is, of course, a groovy Woolworth's store--you can see the checkout counter and everything! Incredible view. 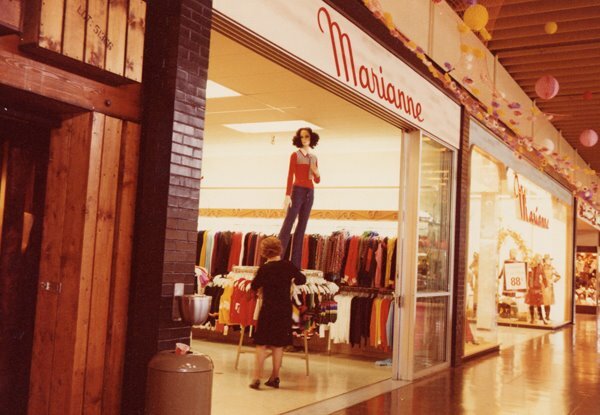 The second is a Marianne ladies clothing store. Woolworth & Woolco Stereo Spectacular! Fresh in the mail yesterday was this great postcard! Another very moody shot, just dripping with cool retro ambience. 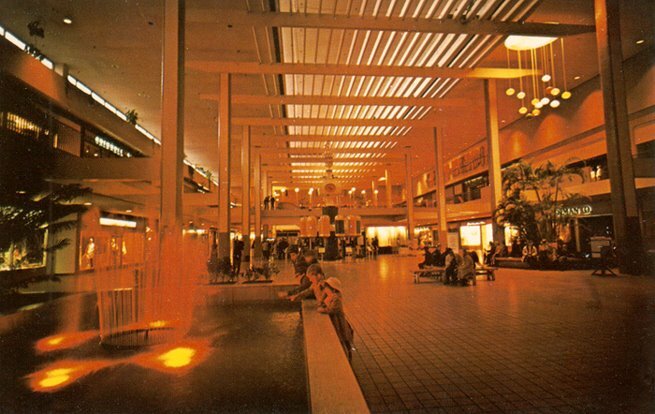 In this one we see Midtown Plaza mall bathed in a warm, romanitc glow. 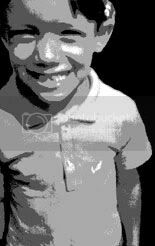 And yes, this is the actual lighting and coloring of the original photo. I did a little color-correction and balancing on it to ensure the finished scanned image would match the original as closely as possible. And it does. Obviously, this warm orangish tinting was done intentionally for atmospheric effect, and was not quite the normal lighting in Midtown Plaza, even at night (in fact, you can see it's actually daytime in this photo, I believe, if you look in the upper-left cieling windows). 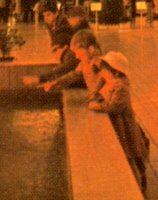 I thought the kids gazing into the fountain was a nice little moment in time, too, so I scanned a blowup of it (at right) for a closer look. It was worth it. I remember doing the same thing in our local malls with my brothers and sister growing up. Getting hypnotized by the whole thing: the relaxing sounds of the gurggling fountains, the shimmering ripples on the surface, the glistening coins blinking up at you from the fountain's tiled bottom, all mixed with the murmuring din of busy shoppers and lulling muzak echoing throughout the mall in the background. Gazing into those fountains of youth was one of my favorite things to do as a kid. Maybe I should do it more often now? Haven't in a long time. Oh, and want an eyeful of architecture? Of course you do. Be sure and click on the "Bird's eye" view on the aerial link below. "Midtown" Plaza is right--this mall is wedged right in the middle of it all! 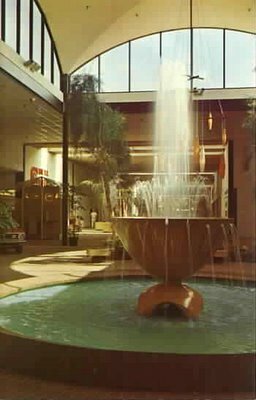 Anyway, this is not vintage, just a video clip I came across on YouTube, of an amazing choreographed fountain in Aberdeen Mall, in Richmond, British Columbia. The waters are dancing to "What a Feeling", from Flashdance. I think it's kind of cool myself. Of course, it might get annoying if you're trying to shop and it goes off to much. Wonder how often they actually run it like this? If you worked there you might get sick of it real fast, too, heh. 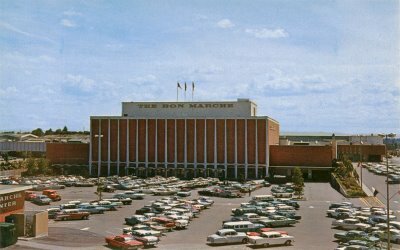 This mall was so amazing and had such a fascinating and rich history, that I won't even try to recount it all here. Besides, that's already been done for us very admirably, by dedicated fan, Josh Goldstein (see the Wikipedia link below). I think this mall deserves a lot more attention than it gets! The more you learn about it, the more I think you'll agree. 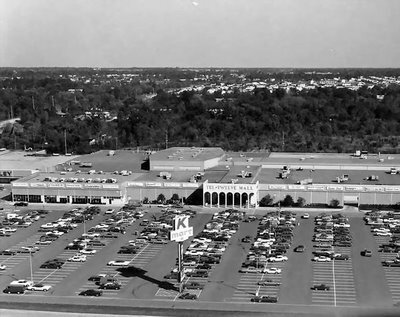 Dixie Square Mall currently has a documentary in the works about it... well I think Cinderella City is equally deserving of that kind of attention. It was truly a huge, breathtaking shopping mall, with tons of character and color! Just thought I'd mention for anyone out there who's like-minded as me, a new film that's currently in limited release (comes out on DVD in August), called Sketches of Frank Gehry, from Sony Pictures Classics. It's a documentary by Sydney Pollack, about the life and work of renowned architect, Frank Gehry, who not only designed a little building called the Guggenheim (you may have heard of it) to name one, but more importantly (to us anyway, hehe), the Santa Monica Place mall, along with many other beautiful buildings. Anyway, I dig what I see in the trailer above (check out the related interview with Sydney Pollack on this Amazon page, too). Really looks interesting! I'll probably have to wait till next month to see it on DVD myself, but I figured I better mention this movie, since there aren't too many architect movies coming out these days (lol). 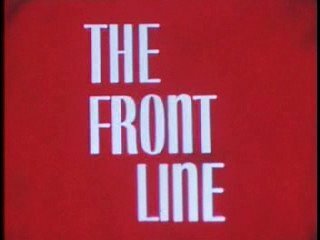 I'd guess a couple of you here have seen this already, no? Now called The Somerset Collection (which I hate), this is an upscale hoity-toity mall right in my own backyard. In fact, I'm near it almost every day--though I can't afford to shop there. Heh. "The Skywalk — Spanning Big Beaver Road and integrating the twin centers is a 700-foot, enclosed, climate-controlled Skywalk. One of the first skywalks of its kind in the country, the bridge features a moving sidewalk to move shoppers between Somerset Collection South and Somerset Collection North, enabling them to conveniently shop the entire center in a single trip." Just like in The Jetsons! And I do have to admit, it is kind of cool in person. You can actually see the Skywalk connecting the North and South malls in the aerial I link to below. Happy Monday everyone! And how's this shot to start the vintage mall week off here? Nice, huh? 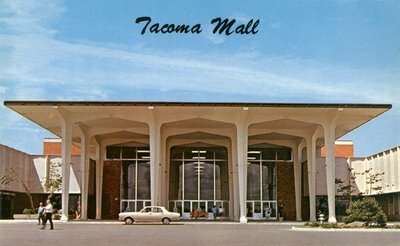 Man, Tacoma Mall was a pretty cool mall in its early years. Every vintage shot I see of it I love! What style! This photo obviously has a lot going for it. I dig the creamy color scheme, the majestic columns, the lighting, the two kids in the foreground (the smaller tyke having fun with a balloon), and also that great looking tiered fountain layout! Wow. 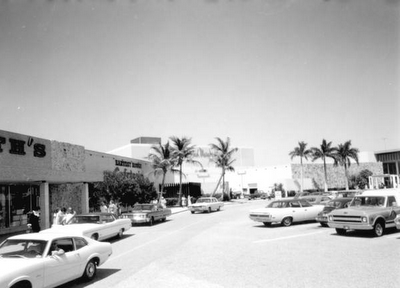 Actually, this shot sort of puts me in mind of that incredible Palm Beach Mall photo I posted a while back, too. Same vibe. 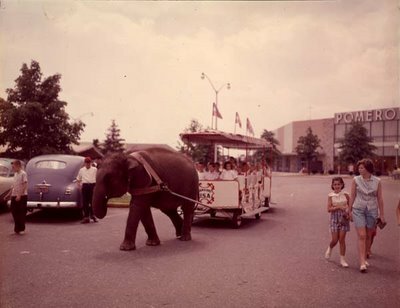 Nice shot from this shady corner (looks like one of the few) of the parking lot at Park Central. Store sign on the left says "Coffee Dan's", I believe, and there's a Walgreens visible in the center, and the Goldwaters anchor on the right. 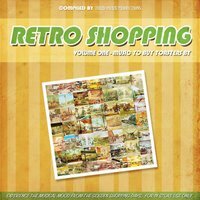 Be sure and head over to Ultra Swank today, guys and gals, and download my pal Chris' absolutely groovylicious new mix collection, Retro Shopping Volume 1 - Music to Buy Toasters By! 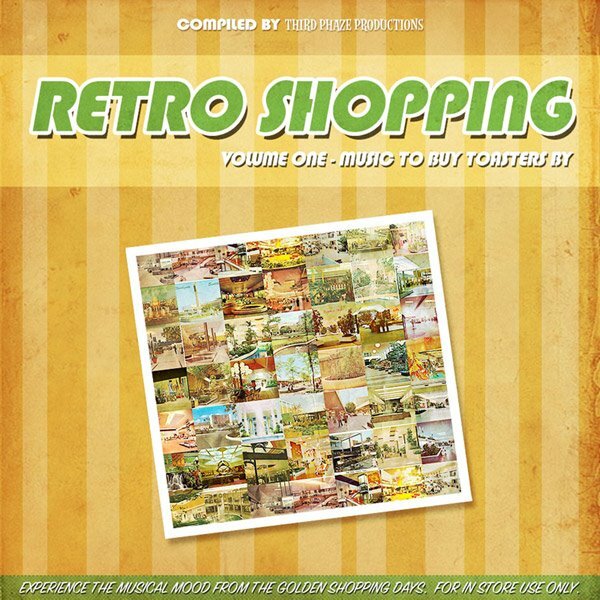 An amazingly cool musical treat consisting of vintage shopping-inspired tracks, that is sure to rock the world of anyone who digs this here blog! Chris and I are on the same wavelength obviously. Many months ago after I first posted my vintage shopping radio spots and jingles collection here (need to re-upload it yet again), I started slowly putting aside tracks to do this same kind of mix collection (seemed like an obvious no-brainer), but Chris has beat me to it. And I'm glad he did! Not only is he saving me some time now (hehe), but more to the point, he's done a fantastic job!! He's pulled together a great mix of songs that really evoke the whole vibe I'm going for with Malls of America. I'm already playing the HECK out of these tracks myself! It goes without saying that it's especially perfect to listen to whilst reading this blog. Give it a try. Download it and play it every day when you read MOA. :) Because, if this blog had background music (and I'm toying with that idea), this kind of stuff would be it! Look no further. 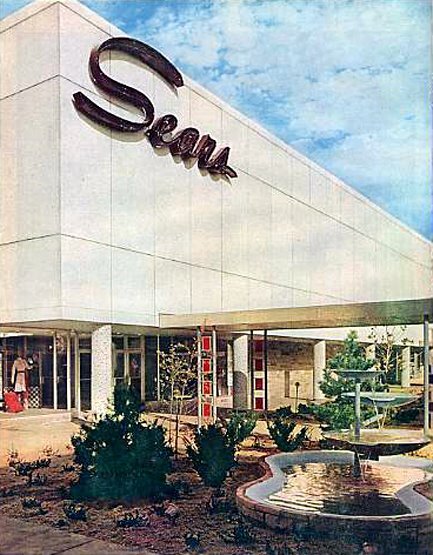 Though I'm not sure which exact mall this Sears store is attached to (and the image quality isn't great--it's from an old magazine ad), I just really like this shot. There sure is a NICE retro vibe going on in it! Wish my backyard looked like this. "World's first private subway - Through The Bluffs of Trinity River to beautiful sky-high Fort Worth, Texas. This is the first privately owned Department Store Subway in the world. Two of its seven Electric Cars are seen passing at the Entrance. 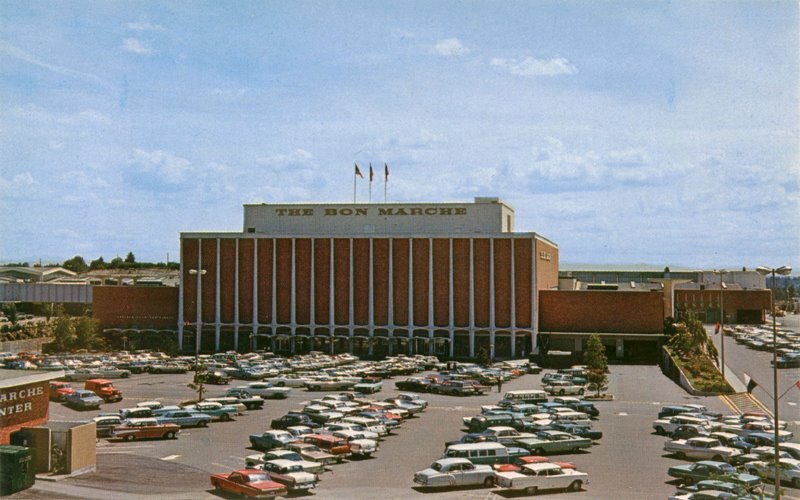 Owned by Leonards Department Store, the vast river-level parking lot, subway and cars are free to the public, making the project unique in the annals of Downtown Business, Enterprise and Pleasure." 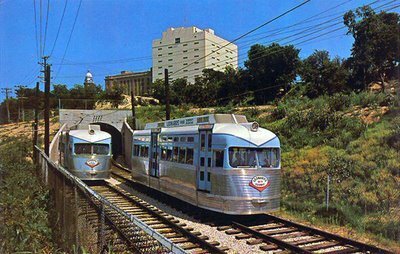 "The Tandy Center Subway operated in Fort Worth, Texas from 1963 to 2002. It ran a distance of 0.7 miles (1.1 km) and was, during the period of its operation, the only privately owned subway in the United States. The subway was originally built by the Leonards Department Store in 1963, connecting the store to its large parking lots on the edge of downtown. Originally known as the Leonards M&O Subway, it consisted of one underground station beneath the store and three stations in the parking lots. The Tandy Corporation purchased the department store, its parking lots, and the subway in 1967. The corporation built its headquarters, the Tandy Center, on the site in 1974. Although it demolished the original store, Tandy retained the subway. 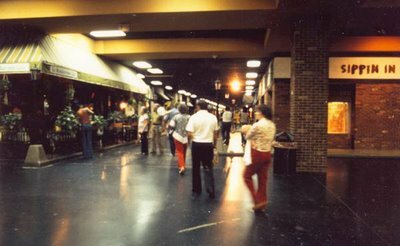 The small subway primarily served patrons visiting the mall at the base of the Tandy Center. 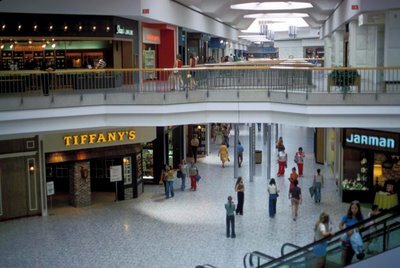 However, the anchor tenant moved out in 1996 and the mall declined. The Tandy Center Subway ceased operation on August 30, 2002, thus ending the last privately-owned subway system in the United States." While this blog's main purpose is definitely to celebrate the past, it doesn't hurt to take a little peek now and then at the future we're heading towards, to help put the past we're celebrating into more perspective (like the RFID video I posted a few days ago). If you get where I'm coming from. So now, behold the new Displax Interactive Floor and Window! In the video above, you'll see an example of one of these informational & advertising products installed in an unnamed shopping mall. Welcome to true Minority Report/Blade Runner territory here, folks...or I guess, as the makers of the Interactive Display, Displax, say on their website: Welcome to the future! I've noticed something that bugs me. That is the fact that many great reader comments this blog receives on a regular basis, probably go largely unread and un-replied to, simply because they're made in archived posts that are off the main page. My guess is that most of you here would enjoy the added information, memories, and dialogue from these new comments, but that you probably don't even usually see most of them (unless you regularly dig through each and every archived page here, which would be a lot of work). Of course, as owner of this blog, I get to see any new comment automatically (each new one is e-mailed to me as soon as it's posted), but there's no way for you guys to know when old posts get new comments. And I think that's a shame. In a way, this amounts to a lot of fresh new content each week that everyone else pretty much misses out on. Sometimes people clearly work very hard on thoughtful, lengthy comments, and share wonderful details or memories in them (which I really appreciate! ), and these shouldn't fall on deaf ears, I don't think. Problem is, Blogger doesn't implement a "recent comments" sidebar feature by default, and though you can "hack" the code of your blog template and actually add that feature, it's too simplified and limited to be very useful, unfortunately. Any of these hacks I've seen to do this, will only show you the most recent comments on the main page, and that's just not very helpful. I think people should be able to see when older, archived posts get new comments, too, not just the newest stuff on the front page (which is easy to monitor yourself anyway with a cursory glance and a touch of blog familiarity and memory). But especially for a blog like this one, I think new comments in archived posts still need to be seen! So, in an effort to make sure no one misses anything, and that all comments do get seen, I've decided to try doing it myself by hand (I'll try to do this at the beginning of each new week from now on, if it proves useful and worth doing. So, if you haven't checked some of these past entries in a while, you might want to take a peek at the new comments. I'll start with last week first. Here are all the posts that saw new comments last week (I think I got it all right)..
Love this retrolicious shot of the '60s Tacoma Mall entrance! Just awesome. 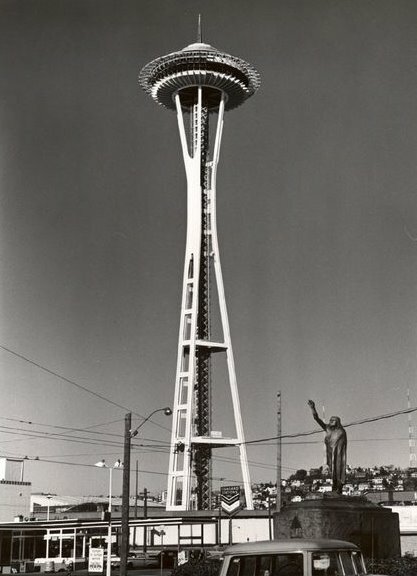 And according to the source for this photo, the architect of this mall, John Graham, was the same man/firm who designed the Space Needle in 1962. I kind of get a sense for that relationship when looking at this picture, don't you? The beautiful fountain in Edgewater Mall (originally Edgewater Plaza). See my previous entries below on this mall for more nice shots of it. Though she took a direct hit from Katrina, and suffered some severe damage, Edgewater Mall galliantly reopened just 10 weeks after the storm, and continues its healthy recovery and operation today. Bravo! !